No penalty for cancellation 48 hours prior check-in. Cancellations made within 48 hours to check-in or No show are non refundable. Welcome to the newest hostel in Cancún! Señor Frogs Hostel offers a new standard in an astonishing location 2 min walk to the beautiful white sand beach! The hostel features a floating pool and a huge bar with an amazing lagoon view, a cosy hangout area were you can enjoy the sunset surrounded by people from all over the world and all amenities a backpacker could wish. Don’t miss our BBQ pool party every Saturday! We also collaborate with Party Rockers travel Agency to offer help with booking tours to the main eco parks, ruins, attractions, snorkeling or diving in the 2nd Biggest Coral Reef in the World. Our staff can help you find your way to the best parties and attractions, just come to reception and speak to one of our friendly staff members! Continental breakfast is served daily from 7:30-10:00 am. One of the most important traits is having our Chef personally cooking fresh on a daily basis; we serve an all-you-can-eat continental breakfast. Right at the Hotel Zone, located where all the big resorts and party are at. By the lagoon, across the street from the beach. In addition,. you can also visit other famous attractions of the city such as Mercado 28, Olímpico Andrés Quintana Roo and the Planetarium of Cancun, amongst other important attractions of our city. Beautiful brand new rooms, we have dorms fitting 6, 8, 10 and 12 people (all of them with two ensuite bathroom, except for the 6 bed-dorm which has one). 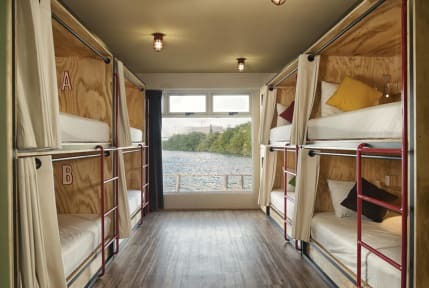 Every bunk bed with a privacy curtain, bed lamp and USB plug, big locker with a plug inside as well. Private bedrooms for two people available, all ensuite bathroom. Cancellation policy: 48 h before arrival. In case of a late cancellation or No Show, you will be charged full stay. A deposit of $50 USD will be charged at the time of check-on for all reservations in Private rooms. In the case of any damages/theft of the room, the deposit will be retained. If the damage/theft is greater than the amount of the deposit, the guest will be required to pay the total amount of the repair/replacement. This deposit is 100% refundable in the case there is no damage/theft of the room. Payment upon arrival by CASH. No credit cards accepted. This place exceeded all my expectations, it is definitely a place that is safe. Also the service is super excellent, thank you! See you soon. todo excelente y muy divertido. Most comfortable bed I've slept in at a hostel! The place is clean and in a good location, across the street from the beach, and easy to get to from the airport by taking the ADO bus (CUN airport - Cancun downtown ADO bus depot, about 86 Mexican pesos), then the R1 bus (ADO bus depot downtown Cancun - hostel, about 9 Mexican pesos). There is a pool out back, and there is a reasonably priced Mexican restaurant next door. The staff is friendly and the place feels safe. Bring a lock for the locker. Best hostel ever !!!! And the beautiful girl that does the activities is amazing!! Great location close to beach and night life and also central if your interested in doing day trips up to Isla Mujeres or down to playa del Carmen/ Cozumel. Really nice and clean place. This is party hostel! Perfect if you are a sociable solo traveler or you are on a trip with your friends. Not so much if you enjoy the quiet or you want to rest in bed after a day long tour. Great value for your money. Staff is friendly and attentive. Perfect location, steps away from punta Cancún. I had the best first solo trip ever at Senor Frogs. Staff were professional and attentive to all your needs. Mauricio one of the staff members was most helpful to me and organised a tour and let me know of what was going on around town. Very social and cool vibe at this hostel. This hostel is in an excellent location. It was fairly clean except for the showers. I would recommend more security especially at later hours of the night. I liked the privacy of the beds as each one had a curtain. The outlets in the lockers and the beds were also a very nice touch. The breakfast included is also one of the better breakfasts I’ve had at a hostel. Overall, it was an excellent place to stay.